Why do we use words like love when we don’t mean them? 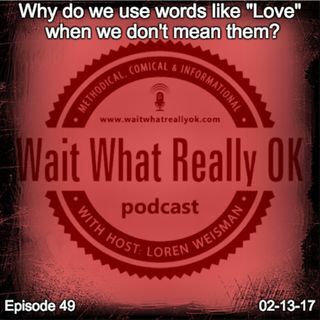 Wait What Really OK Podcast Episode 49 hosted by Brand Precision Marketing Strategist and Counselor, Loren Weisman asks, Why do we use words like love when we don’t mean them? What does love mean to you and in the overused usage of it, doesn’t that make it a little less? In a day over oversaturated words and the loss of impact in the meaning, its key to look at what we say in our pitches, our marketing and our sales. Are we just ... Más informaciones coming off like everyone else or would it be better to take a little more time to make the pitch, the bio, the tagline or the message have that much more of an impact? The attention to detail in the words you use and the words you choose can create that much better of a connection, engagement and professionalism for you, your service or your company. Podcast Blog Supplement for Episode 49 of the Wait What Really OK Podcast with Loren Weisman. Podcast Link Supplement for Episode 49 of the Wait What Really OK Podcast with Loren Weisman. Is someone marketing you without honor? Blind trust marketing fails. Podcast Video Supplement for Episode 49 of the Wait What Really OK Podcast with Loren Weisman. Podcast Photo Supplement for Episode 49 of the Wait What Really OK Podcast with Loren Weisman.